Is it unorthodox to start a review with an appreciation of the recording quality? Yet without the technical skills of Matt Robertson and the sheer genius of the mixing by August Wanngren, we’d not have this album. Without those engineers, the energy, the passion and the sheer life-grabbing urgency that always characterises live performances by Phronesis, only a few hundred people would have experienced this extraordinary trio live, in the round, at The Cockpit in November 2013. So we have the best of both worlds in this wonderful album – Life to Everything – the sheer joy and expansiveness of live performance fused with recording-studio sound. Of course, if you were not there you would not know that Anton often plays with cutlery, that Ivo sits so quietly at the piano, you think he is asleep, and that Jasper moves with his bass like a dancing partner. And the result of these things is that unmistakable Phronesis sound! As the audience we responded with whistles, whoops and gasps and that is what you will do at home, you will feel you are there. The bustle, the clatter, the dancing-down-the-street feel of Anton’s compositions such as Herne Hill is balanced by the ethereal, symphonic beauty of those of Ivo where he takes us into space and deserts, and explores the unspoken strength of deep friendship in Phraternal, the life-changing experience (for him and us) that is called Phronesis. And Jasper’s strong, instantly hummable tunes provide the sinew that runs through it, his bass playing is so delicate and responsive it drives the Phronesis machine as if it were a high-powered car – which it is. 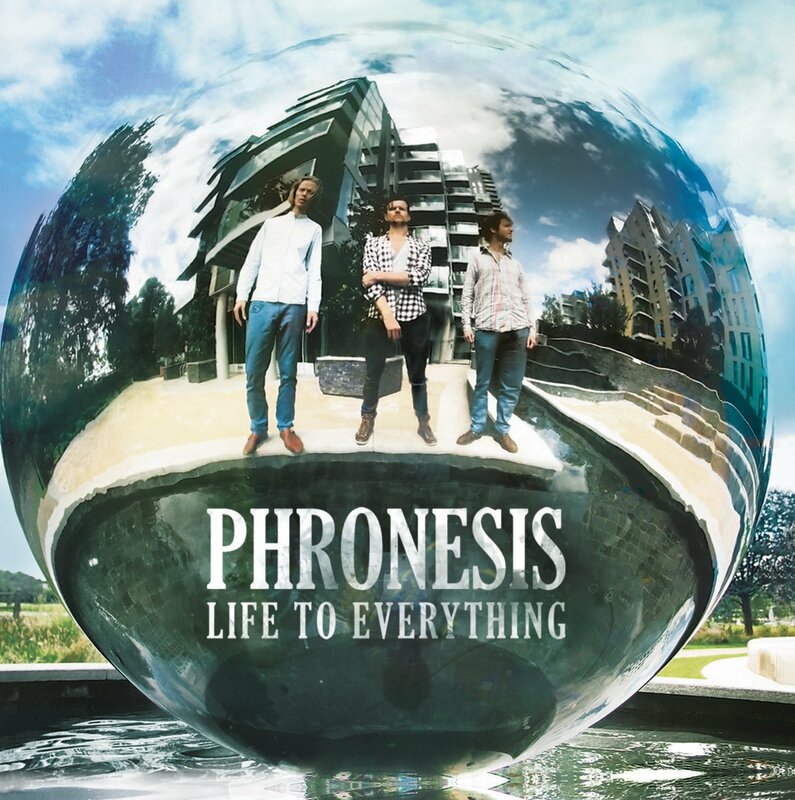 Phronesis’ fifth album, Life to Everything is quite simply one of the best albums you will hear this year! And their best! Available here from Edition Records. On Twitter a few days before Brecon Jazz Festival, Mercury Prize nominees Roller Trio promised they would be playing all our favourites at their gig at the Guildhall on Saturday night. So they started with Deep Heat, Roller Toaster and The Nail That Stands Up and then played us a few new tracks that had no name but had been saved by their recording engineer as Doris and I hope their new album has a track called Doris, there is something direct and no-nonsense about this band. My notes refer to Dalek music. This is music that Daleks would like if given half the chance. It is exciting, edgy, overwhelming, physical and above all, tuneful. They are fabulous, like a workout with no effort. No old favourites for Phronesis earlier that afternoon. An excited full house at the Theatre (the queue to get in snaked for several hundred yards) were mesmerised by a set of new compositions, at least five of which had never been heard before outside of rehearsal. The set list included the sinister Urban Control, the haunting Lost Nomads, Life to Everything, the affectionate Herne Hill, Fraternal, Behind Bars, Fly on the Floor, two others with no name and an encore of Suede Trees. If we were guinea pigs for new sounds, we passed the test, the buzz afterwards was ecstatic. There were unmistakable signs of the wisdom and confidence gained from world touring, a vast auditorium-filling sound produced with seemingly minimal obvious effort, so relaxed is their partnership. Did I detect more arco than previously from Jasper? It felt very lyrical at times. There was an almost pastoral feel to one of the compositions. Now we all have to wait, patiently, til November when these gems will be recorded at the Cockpit and released on Edition Records. The contrast between well estabished and new continued on Sunday – trumpet player Laura Jurd gave us a very complex and confident set at the Cathedral. The Cathedral’s acoustics provided the ideal place for her clear sound and for John Surman who followed. The John Surman Trio – a supergroup comprising Chris Lawrence on bass and John Marshall on drums – treated us to a largely improvised set of compositions inspired by the Cathedral and sunshine. The jewelled light from the stained glass and the cavernous space prompted huge, dark and sometimes scarey sounds, like vast flocks of birds speeding across a dark sky. The compactness of John Marshall’s technique (ex Soft Machine and Nucleus) produced lots of noise with minimal movement, an interesting comparison with powerful drummer Luke Reddin-Williams of Roller Trio whose theatrical gestures were as eye catching as they were effective. My festival ended with another supergroup, the Anglo-American The Impossible Gentlemen, whose confidence and good humour provided the perfect prelude to leaving Brecon. We heard tracks from their upcoming album Internationally Recognised Aliens. I preferred their quieter compositions, notably the beautiful Ever After by Steve Swallow and Gwilym Simcock’s bluesy Barber Blues. which I had heard before, with Lighthouse in the same venue last year. If anyone can play a piano and make it look as if he is skimming across hot coals it is Gwilym. He is quite breathtaking and very engaging. And that was the magic of Brecon. 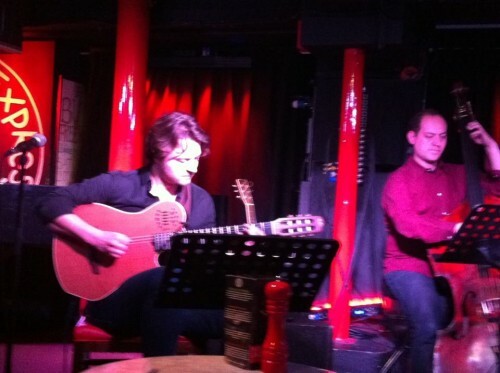 The penultimate gig of 2012 for Phronesis was held in the North Wall in Oxford on 1 December, a good venue for listeners with excellent sight lines, comfy seats and lovely mellow brick walls. Old fans were probably hoping for some new material and were well rewarded with at least three new compositions which were not attributed – perhaps a symbol of a new Phronesis, utterly confident in each other’s presence. As I sat there I thought back briefly to seeing the Brad Melhdau trio just two weeks ago at the Barbican, and it hit me – this trio has exactly the same confidence on stage as that well-established entity, only with more equality. This evening felt daring – old and new were mixed, leaving us to guess which was which – all sounded fresh, deeper, matured like good wine. We heard material from all four Phronesis albums. The sense of continuity in sound and concept, despite changes in drummer and pianist, is amazing, and a tribute to Jasper’s vision. It’s not that the sound is static, it has evolved so naturally that you are unaware that you are learning, that you are adapting to their increasingly complex deep sound. So we started with a tune from the first album Organic Warfare, called Untitled#2 which sounded very stately on the Yamaha piano, five years on, it still worked and sounded new. From their second album we had Love Song and Happy Notes – the latter an ironic commentary on an unwitty heckler. Passing Clouds (from Walking Dark) had an Oriental feel, the gentle movements of Tai Chi made manifest in majestic, floating, billowing sounds with darker clouds evident at the close. The new material has the gorgeous lyricism we have come to expect. Nomads had me holding my breath, it was so beautiful. Ivo has hit a rich seam of tunes lately – his That Syncing Feeling from Yatra is one of my pieces of the year. Another new piece started with a simple melody on bass that I was still humming in the morning – had I heard it before? No, it just comes naturally. One of the joys of seeing this trio live is that you never know how Anton will create new sounds. At one stage, I thought he was striking the stands of his drums, perfectly in tune – actually he had cymbals on the floor I think. But the fact that I thought he was hitting his drum supports did not strike me as odd. Sometimes he plays silently, hitting the air for several beats, always he is mesmerising. You have to see them to really appreciate just how tightly they play now, with such empathy for each other. So I felt very hurt for the band when a woman heckler demanded new, unrehearsed material. It may be Oxford but it was just plain rude to Jasper, it broke the moment. It was extraordinary, to me anyway, that the heckler could have thought that she was not listening to new material when we were. The fact that new material sounded well rehearsed when perhaps it was not is a tribute to the skills of this perfect trio. Sadly, fans in the UK now have to wait until Phronesis’ next performance at the Queen Elizabeth Hall, London on 5 April 2013 when we are promised some guests including the singer Olivia Chaney. It’s a big venue but they can fill it, physically and mentally, they are at the top of their game.